This December heralds in not just the holiday season, which in our industry means a lot more cargo on the roads and a lot more traffic in its way. This year however, it also marks the government-mandated deadline to comply with new electronic logging device (ELD) requirements. Yes, the ELD deadline of Dec. 18 for phased-in compliance is quickly approaching, but focusing on the mandate as some regulatory to-do list item that only aids in avoiding steep fines and penalties doesn’t capture just how important this move by the Federal Motor Carrier Safety Administration really is. Rather than thinking of ELD as some red tape, think of it as a huge enabler for fleet management. In reality, ELDs will not only save businesses time by automating an arduous process of logging Hours of Service, it will guide them to many more areas where they can optimize their fleet. From engine run-time parameters to information on individual driver performance, ELDs allow fleet managers to reduce paperwork and streamline operations. If a new technology allows an industry to perform the same tasks at a cheaper price and in less time, that always proves a win-win for industry and government. The detailed access into fleet information through the ELD and add-on technologies has never been possible before when managing a complete ecosystem of assets. We recently announced our partnership with Barcoding, which makes it possible to monitor the condition of the cargo itself — things like temperature and humidity, exposure to light, and shock and movement throughout the journey with their AAT solution and CalAmp’s SC1000 and iOn Tag™ smart sensors. This supply chain solution gives fleet managers insight down to the pallet or even individual product level. Shipments often arrive late or go missing entirely. Imagine being able to improve each part of a supply chain down to this level of granularity and it’s easy to see why a supply chain integrator with this capability would be the preferred logistics solution provider for many retailers. Especially during the holidays, adding this precision tracking to shipments and trucks will create stronger end-to-end partnerships throughout the supply chain, with retailers knowing they have a logistics company they can trust. Furthermore, deploying these internet-of-things (IoT) device and peripheral solutions across an entire fleet can be fast and easy. For example, we recently announced our V-Series ELD. It is a self-install, turnkey ELD solution that streamlines integration between the vehicle engine, telematics device and compliant Hours of Service application. As an all-in-one bundle, the V-Series ELD allows carriers to deploy an ELD compliant solution rapidly for both light- and heavy-duty fleets. This holiday season is set to be the year for IoT devices, from personal assistants (Alexa, Cortana or Siri) to smartwatches and home automation devices (Google Home and Amazon Echo). The same will be true come this December 18th for fleet management. This shift is something we call The New How. It marks a new way to do business, whether brick-and-mortar or electronic, where solutions like ELDs can connect business outcomes with the data driving them. With endless opportunities for savings, enhanced logistics management and business clarity, having ELDs on the road and on every cargo vehicle will prove to be more than “being compliant” — think of it as the gift that keeps on giving. 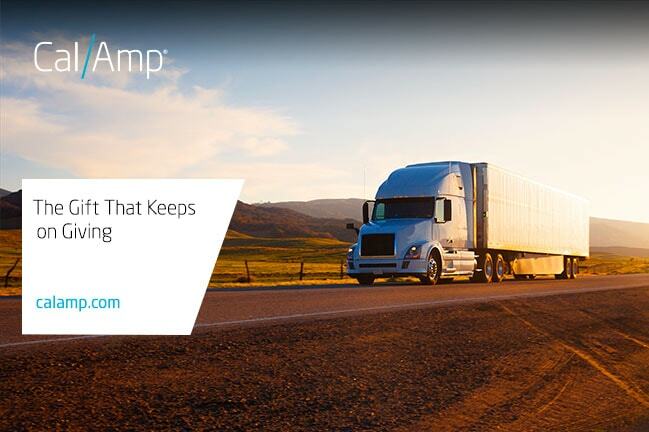 If you would like to learn more about CalAmp’s V-Series ELD, visit our page here.